We were delighted to be invited to take part in the Flower Follies Festival at the Parish Church, Slimbridge, over the May Bank Holiday weekend. It was special because historically the church had tried to stamp out dowsing and healing skills during the Middle Ages, and even today, some churchgoers are a little wary. Conversely, some of our members are regular churchgoers themselves! So it was great to be welcomed and to add our display to others including Slimbridge’s WI, Local History Society, Royal British Legion and Royal British Legion Social Club, Horse Show, Horticultural Society, Twinning Society, Bright Lights Sunday School, Play Group, Variety Show Group (famed for their annual pantomime), the Parish Council, and a lovely white and gold wedding-themed history of the church itself in the Chancel. Our Membership Secretary, Barbara Davis, did us proud. She used blue delphiniums and white carnations to illustrate a fountain of water, standing on turquoise silk which looked watery too. In our second windowsill, Barbara used a spiral of yellow chrysanthemums to illustrate earth energies, which often send our rods a-twirling. 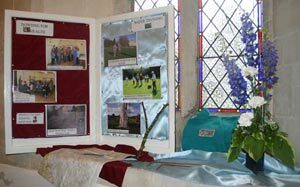 There were also photo boards to show what else we get up to, and a small poster proclaiming Slimbridge Dowsing Group usually meets in the Slimbridge Village Hall on the second Thursday of the month at 1.45 pm and the fourth Saturday of the month at 10.15 am, when all aspects of dowsing – Water Divining, Health, Archaeology, and Earth Energies – are covered. Divining with rods or pendulums as well as remote dowsing are included. All levels of ability from beginner to experienced are welcome. Blue delphiniums and white carnations represent a water fountain on the Slimbridge Dowsing Group display at the Flower Follies Festival during the Bank Holiday weekend. Photo: Patrick Howell. 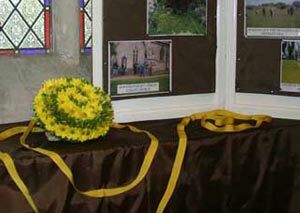 A spiral of yellow chrysanthemums represent dowsing for earth energies which often send Slimbridge Dowsing Group rods a-twirling. Photo: Patrick Howell.